What do LeBron James, Justin Bieber, Hailey Baldwin, Whoopi Goldberg, Ben Simmons, Scooter Braun, Swaggy P and a bunch of yellow milk crates have in common? They all came together — at a skate park no less — for an incredible photo Thursday during New York Fashion Week. 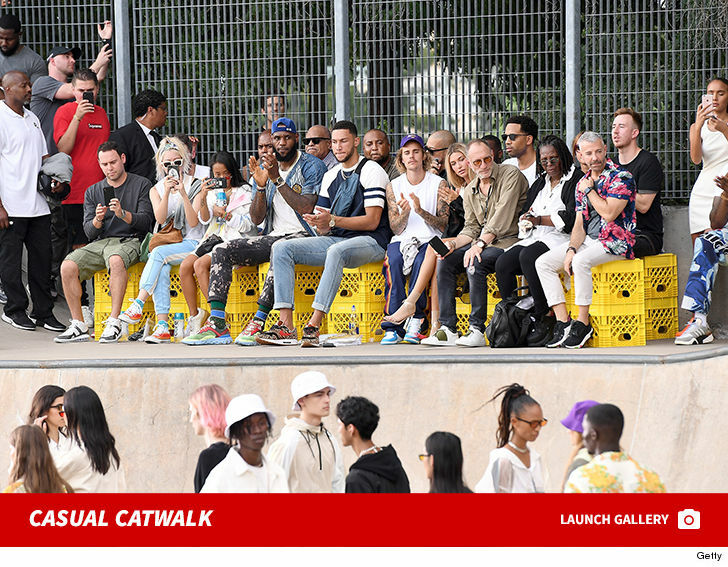 The murderer’s row of sports stars and celebs were gathered for the John Elliott runway show … the runway being the center of a skateboarding ramp. It looks like the lineup includes Robert Englund and Maverick Carter, as well … but we’re not certain. No clue who the guy behind the fence peering in is, though. As we reported … stars like Nicki Minaj, Cardi B, Kendall Jenner and more have already flocked to NYC for Fashion Week events. And, the list keeps growing.